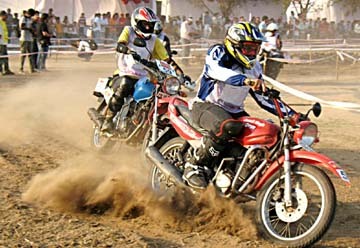 Chandigarh,Madhup Yadav , March 19 : The 23rd SJOBA-Thunderbolt Sub-Himalayan Rally got off to an exciting start today with the Super Special Stage being held at the Exhibition Grounds, Sector 34. All the 71 Gypsies, Cars and bikes competing in the Challenge Rally participated in this leg and the drivers zipped around the specially created track, negotiating the hairpin bends and leaving behind a cloud of dust as they exhibited their skills. From among the 71 competing vehicles one Gypsy (Team 1) negotiated a sharp turn too fast and overturned. The SJOBA Quick Reaction Team got into action and in under 30 seconds the Gypsy had been put back on its wheels. Because of the special safety equipment that SJOBA has made mandatory in each Rally vehicle like the anti-roll bar, special safety belts, safety helmets etc., no one was injured. In fact, the team of Suresh Rana and Ashwin Naik showed their true adventure sports spirit and immediately raced away to complete their lap. They completed the track in 2:02:01, which was highly creditable. In Gypsies, the team of Sandeep Sharma and Rashid Raza brought in the best time of 1:33:28 minutes. The team of Sunny Sidhu and Surender Kumar Nandal were a shade behind at 1:33:73 while the team of Harpreet Bawa and Inderpreet Singh Brar clocked 1:35:17 for he third spot. In Cars, the fastest was the team of Jagbir Singh Nirwan and Shivkaran Singh Mokha with 1:37:92 while the team of Udaibir Sangha and Jagmohan Singh clocked 1:39:69 for the second spot. In third place was Samrat Yadav and Varun Sachdeva with 1:39:98. For the Second Leg of the Challenge Rally the teams will be flagged off on Day 2 (March 20) from St. Johns School at 7 am and reach Koti Resorts (beyond Shimla) by 4 pm for the night halt. They will be flagged off at 7 am the next day from Koti Resorts and are expected to reach St. Johns School by 3 pm the same day, March 21. The teams competing in the Endurance Trial will be flagged off immediately before the Challenge Rally teams on March 20 from St. Johns. They will also go to Koti Resorts and return on March 21..
For the Challenge Rally, the route is a challenging and adventurous one covering fast tarmacs with winding hair pins, unmetalled surfaces and exhilarating hilly terrain in Haryana and Himachal Pradesh. The route is : Leg 1: (Day 1): St. John’s – Trilokpur- Morni- Mallah –Naintikar – Dilman – Kangar – Marhighat – Narag – Ashinikhad – Jhaja – Chail- Chalada – Tehra – Koti Village- – Koti Resort.. Leg 2: (Day 2): Koti Resorts – Guma – Baldeyan – Mehli – Anandpur – Pawar -Dumher –- Sanawar – Parwanoo – Bhojnagar – Chakki ka Mor – St. John’s.